In Grand Theft Auto V, weapons are an essential part of the game. As of the Last Team Standing Update, there are up to 45 weapons available in GTA V. 29 weapons are available within the base game while the remainder require the installation of downloadable content. Similar to Grand Theft Auto IV, weapons spawns are located in inconspicuous and hard to reach places, and weapons dropped by fallen enemies lie realistically on the ground, glowing to catch the player's eye. Also, like GTA IV, the player buys a firearm one time, then pays a smaller amount for additional ammunition. 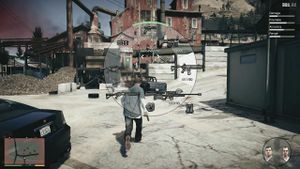 Unlike previous games, the player can hold more than one weapon for each weapons category, and if the player runs out of ammunition, the firearm is not discarded. At the starting "Shooting Skill" level, the protagonist starts with a 600 round carrying limit for most categories. As Shooting Skill is increased, the protagonist's carrying capacity increases, maxing out at 9,999 rounds when the maximum Shooting Skill level is attained. Additionally, increasing Shooting Skill reduces recoil, reduces reload time, and increases accuracy. Shooting Skill is increased by killing enemies and completing Shooting Range challenges; attaining headshots in the case of the former and attaining gold medals in the case of the latter levels up the player at a faster rate. The player can customize their firearms at any Ammu-Nation. Modifications greatly affect a weapon's performance, especially when multiple mods are used in tandem. Certain firearms can accept multiple modifications, while others may have no other customization options besides changing the tint. Extended Clip: Increases magazine capacity. Suppressor: Reduces gunfire noise; however, suppressed firearms deal slightly less damage and have a slightly shorter range. Scope: Increases zoom capability and improves accuracy of non-sniper weapons. Equipped by default on sniper rifles. Advanced Scope: Increases zoom capability for sniper rifles, and during certain missions, works as a thermal scope. Grip: Increases accuracy and reduces recoil by stabilizing the forward grip. Flashlight: Increases visibility in dimly lit areas. The light can be toggled on and off by pressing the right directional button while aiming. Tint: Changes the color of the firearm. This is only for cosmetic appearance and does not affect the weapon's performance. The weapons selection wheel in GTA V.
GTA V introduces a weapons selection wheel similar to Red Dead Redemption and Max Payne 3. In previous GTA games, the player had to scroll through each weapons category to select a weapon, although GTA IV introduced a quick-select feature for certain weapons. Except for projectile and heavy weapons, weapons in each category share the same pool of ammunition. When selecting a weapon, information on which attachments are equipped are displayed within the wheel itself, while its attributes (damage, rate of fire, accuracy and range) are given in the upper right corner of the screen. This page was last modified on 12 October 2014, at 13:05.